The No. 9 UCF Knights graced victory and a chance at the Sweet Sixteen against No. 1 Duke in South Carolina as they competed in one of their best games of the season and one of the highest-profile ever in the program. The 76-77 rapid-fire decision was left to chance as B.J. Taylor strong-armed his way to the paint with seconds left on the clock. An opportunistic Aubrey Dawkins leaped to toss in the bounced shot yet the ball would once again make every turn that wasn’t to the bucket. UCF led the Blue Devils early on and commanded the game in its opening minutes. Tacko Fall, Aubrey Dawkins, and B.J. 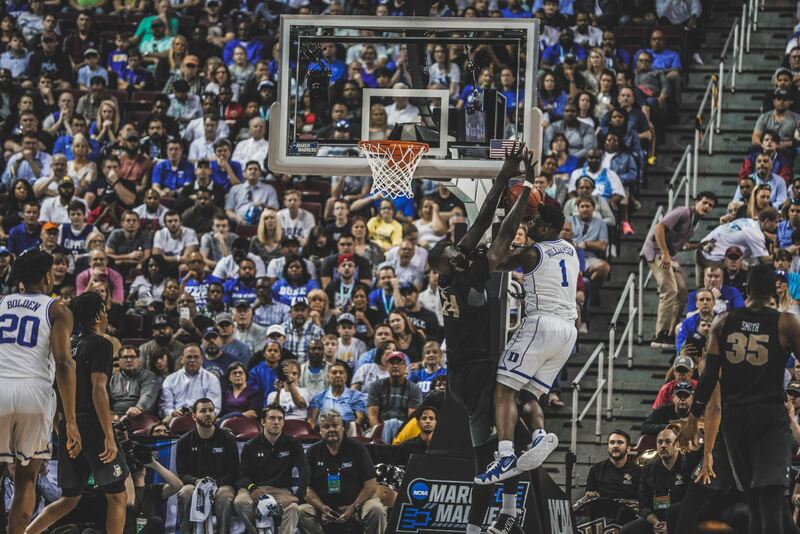 Taylor were the Black and Gold’s star players and it would be Fall to stop Zion Williamson from closing the gap with a layup, soon charging to the rim with a dunk, causing Duke to take a time-out and reorganize. Duke rallied in one of several two-minute dry spells for the Knights and closed the first half with a 44-36 lead. UCF completed three unanswered scores and another Tacko dunk to send Duke to an early time-out. The UCF team lost and regained their footing time-and-time again, earning leads of their own to make the last four minutes an adrenaline rush. Dawkins ended the game with a whopping 32 points against the Blue Devils. Fall finished with 3 blocks, 6 rebounds, 7 dunks, and 15 points and Taylor finished with 4 rebounds and 15 points. The Knights team went 48% in the field (44.8% Duke), 50% at the three-point line (40% Duke), and 75% at the free throw line (40% Duke). A few of the Knights on the court broke down in tears as they witnessed victory slip away from their fingers in real time. Duke head coach Mike Krzyzewski called the game outcome as chance when talking to CBS, “We got lucky,” and consoled the Knights on the court after the game ended. Krzyzewski coached Johhny Dawkins over 30 years ago as Dawkins earned his place as Duke’s second all-time scorer. Dawkins returned to Duke as an assistant coach in 1998 and helped lead the team to a national championship. Krzyzewski lauded Dawkins’ accomplishments and seemed to enjoy seeing his former player and assistant coach in March Madness. Despite the final score, UCF seniors B.J. Taylor, Tacko Fall, Chad Brown, Dayon Griffin, and Anthony Catotti helped to place the 2016-17 and 2018-19 teams in the record books with appearances in the NIT and March Madness. To any fan who witnessed the thrashing of Cincinnati, Memphis, Illinois, and Illinois State in the former, and Houston, Cincinnati, and VCU in the latter to earn post-season berths, it’s clear to see the potential Johnny Dawkins brings to UCF and its players.